Lung nodules, also known as pulmonary nodules or coin lesions, are small growths on the lung that are generally less then three centimeters in diameter. When they grow larger than this size, they are considered a pulmonary mass. The growths are usually round or oval shaped, and are often referred to as a spot. Nodules are diagnosed using a CT scan, followed by an extensive investigation into the patient’s medical history. Generally, patients have no symptoms when they have a nodule on their lungs, which makes the screening process all the more vital. Commonly referred to as tumors, neoplasms grow over time. They can be benign, precancerous, or malignant. Hamartomas and chondromas are both benign tumors that are seen on the lungs. Both forms are generally asymptomatic and do not have any negative impact on the lungs or surrounding tissues. Cancerous neoplasms include lung cancer, lymphoma, carcinoid, sarcoma, or metastatic tumors that have spread from other parts of the body. 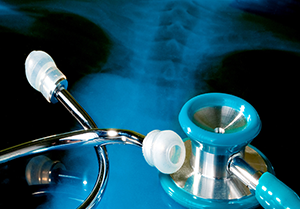 A number of infectious and non-infectious disorders can result in nodules on the lungs that are not active. When these disorders cause inflammation in the lungs, small clumps of cells (granuloma) can form. They are composed of substances that the immune system considers foreign, and become calcified over time. Once a nodule has been identified, our experienced surgeons determine what the appropriate next steps should be. If the nodule is very small, it might be suggested to follow it over time to gauge its growth. Many times, nodules are benign, but it is a safety precaution to monitor progress. Our surgeons can remove pulmonary nodules using VATS (video assisted thoracic surgery), if it is determined that surgery is indicated.